Another summer Wednesday, another Prose Summer Camp! Hooray! Don't sue me, Forest Service! Before we get going, though, for all you Heartstrikers readers who might have missed last Monday's post, I'm going to be writing a special Heartstrikers short story in which (not to be too spoiler-tastic) Bethesda is going to be asked many questions. Rather than make up all these questions myself though, I thought it would be fun to open up the floor to you, the readers! Now that's covered, back to the post! So far in Prose Summer Camp, we've talked about how to write better sentence level description and how to write properly formatted, compelling dialogue (with help from everyone's favorite seer!). This week, we're getting even more fundamental with a detailed look at how to buff up actual sentence level writing. The ability to write a good sentence or paragraph is something that gets brushed over way too often in the genre community. This isn't to say there aren't amazing lyrical writers in genre, there absolutely are, but all too often I see genre writers focusing all of their improvement efforts on the big picture elements--plot, character, world building, all the things that make genre fiction amazing--while ignoring the most basic aspect of good writing: the sentence. It's as though we think that, just because we're not writing literature, bad prose is somehow okay. Now I'm not saying your paragraphs have to be a staggering works of heartbreaking genius to be good (Lord knows mine aren't), but bad prose is like a dirty bathroom. Sure, the sink might be amazing and the showers might use waterflow methods hither-to unknown to mankind, but if the mirror has toothpaste spit marks on it and there's hairballs on the floor, that fancy stuff doesn't matter. If it looks a mess, no one is going to want to spend any time inside. This is such a shame, because--like everything else we've covered in this series--bad sentence level writing is one of the easiest problems to fix. I can't tell you how to have better ideas, but I can show you how to write a sentence that reads well, clearly communicates what you're trying to say, and (most importantly) don't distract your reader from all the stuff you wrote this book to talk about in the first place. Writing at the prose level isn't so much about rules as it is about strategy. Obviously, there are basic rules of good grammar that have to be obeyed if you want to avoid making readers cringe, but you can find those anywhere. In this amazing, modern world, we are only ever one Google search from answering any grammar question, which is why I'm not bothering. 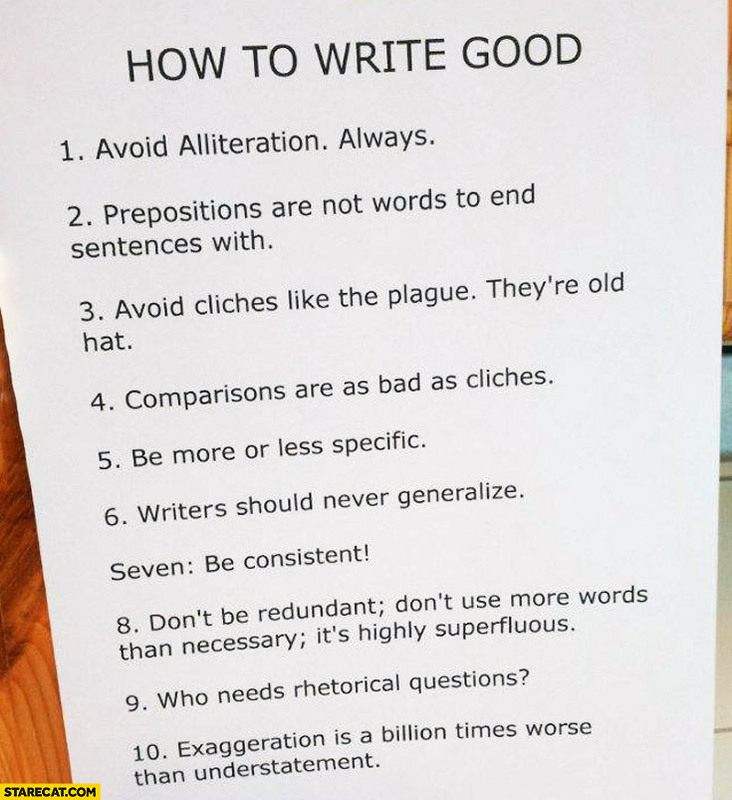 Far more useful, I think, is to look at the reasoning, the strategy, behind why writers write the sentences they do. Now for the fun part. Let's look at some beautiful sentences! "I took off my gun and my mask, and it seemed like I was taking off my skin, so long had I worn them." As you can see, these are all lovely, lyrical sentences. Even the simplest ones are beautiful, just a joy to read. But why are they nice? What makes this writing good? A big part of it is the creativity. All of these sentences have a nice hook, something that grabs our attention and makes us want to read more. But they are also beautifully constructed. Each one is clear, with the central idea boldly stated. "The half life of love is forever" has no waffling or obstructing language. It put the idea out there and lets it speak for itself. This is good, because the idea is strong enough to take it. That's the magic combo for a good sentence: a strong idea clearly stated. More on this in a bit. All of the examples above are from literary works, including the Alan Weiseman quote, which is from his phenomenal non-fiction book The World Without Us, an exploration of what would happen to all our infrastructure--our homes and farms and roads and power plants--if every human on the planet simultaneously disappeared. It's a wonderful book and a must read for anyone who wants to write post-apocalyptic fiction, but the real stand out is its prose. Weisman's language is incredibly beautiful, far more so than you'd normally expect from a speculative science book, and the end result is one of my favorite reads of all time. I think we can all agree that these are some truly BAD sentences. What's most interesting for me, though, is that they're all bad in one of the two ways. They're either unclear, or they're based around a bad or clunky idea (like comparing thoughts to underpants). Sometimes, as in the last example about the boat and the bowling ball, they're both at once! This is the reader killing combination. There's no coming back from a bad idea poorly executed. It doesn't matter how good everything else is. You could have the most amazing plot, characters, and story ever told, but if your actual sentences are bad, readers will never see them, because they'll have already put the book down. Now, hopefully, your sentences are nowhere near as bad as the bad examples above, but they probably aren't as good as the good examples, either. That's fine. Even the writers I quoted aren't that good every line, and you don't have to be, either. 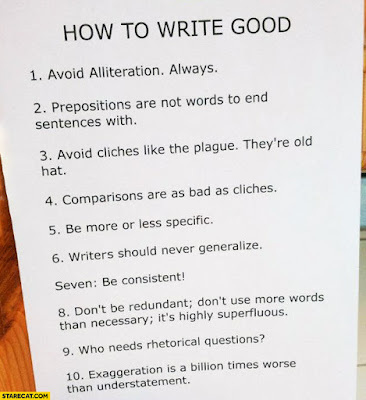 What's important here is that we understand why the bad sentences are bad and the good ones are good, and that comes down to the way the author chose to write them. When you're choosing your words, you don't have to pick the most beautiful or flowery. You don't have to be lyrical or poetic. All of that stuff is stylistic choice. There are many, many writers who focus on creating absolutely stripped down, bare bones prose with amazing results. How you choose to write is entirely up to you, but if you want to craft good sentences, the only thing you absolutely must be is clear. If I write a sentence where Chelsie swings her sword, my primary goal is to make sure my readers understand that Chelsie is swinging that sword. If I choose, I can also add text about how she swung it and what the result was. No matter how many other details I decide to pack in, though, the main idea of the sentence will always be Chelsie swinging her sword. That's the point, the reason this sentence exists. Everything else is just modifiers. This is what I mean when I talk about strategy in sentence writing. I can't tell you how to write a beautiful sentence in your style because I don't know your style. I can't tell you what to say or how to phrase it because I don't know your world or your voice. Only you know those things. But while I can't tell you the details, I can tell you that the fastest way to improve your sentence level writing is to make sure every sentence has a clear idea. This is the strategy I follow in all of my work, because I LOVE to pack my sentences down like they're going on a five month vacation. This was a huge problem for me for a long time, and it wasn't until I started to actually think about what I was writing and why that my writing started really improving to publishable quality. I'm sure many of you don't have this problem, but I still think that any author who takes the time to make sure their sentences have one central, clear idea can't go wrong. There's a lot of information to get out in a book, and the temptation to get as much of it out at once as possible can be brutal, especially for little details that are important but not dramatic. If this is you, avoid at all costs. Don't load that sentence down with every idea under the sun. That's how you confuse people and end up with crazy run-ons. Instead, decide what you're going to say, and then say it clearly. If this is the sentence where the hero declares his love, have him do that. Don't muck things up by trying to cram other information into the same breath. But this isn't just for the long form writers in the crowd. This strategy also applies to the short sentence fans who too often falter in the opposite direction with sentences that are too short and don't tell enough. Again, long or small, that sentence doesn't just have to be grammatically correct, it needs to have a point: a central idea everything else can wrap around. It needs to be a bead on the string of the paragraph, or why is it there at all? I realize putting this much thought into every sentence might sound ridiculous, but I swear it's not as much work as it seems! Most of us do this automatically, but if you're having trouble with a sentence or a paragraph, employing this strategy can be the key you need to hacking through. I'm not saying it's a magic bullet, but I've found that the act of simply making sure every sentence has a single good idea clearly stated will all but guarantee a positive outcome. You might not be writing deathless prose, but you will be crafting clear, readable sentences that your reader will happily breeze through in their rush to get more of your plot and characters. And if you do manage to land a really well crafted turn of phrase, that's just icing on the cake. Speaking personally, I love landing those sentences I just know readers are going to highlight on their kindles. But while those are killer when I can pull them off, they're never my primary goal. For my writing, the strategy is always to make sure that the prose serves the story. I'm not here to write poetry. I'm here to tell you a damn good story, and I can't do that if you're having to pick your way through every sentence like it's a labyrinth. This often means I have to rein myself in since (as you can probably tell) I love a long sentence! I also love my dramatic, dangling, drawn out descriptions. Both of these are fine if I can pull them off, but the moment they start to get in the way of readability, then that sentence is now working against me, not for me, and that means it has to go. Again, this isn't to say you can't be flowery. If that's your style, go for it! There is a long and noble tradition of lyrical Fantasy writing. But just because your style is poetic doesn't free you from the burden of clarity. Beautiful language is no good if your reader can't figure out what's going on. Remember: this is a book. Your words are the reader's only source of information about your story. Whatever your writing style, clarity must be your first goal, because without it, everything else is lost. But like all medicines, clarity can become a poison if taken too far. Let's go back to our Chelsie example. "Chelsie swung her sword. It hit the dragon in the head. He died." is not good writing on any level. It's clear, but it's nothing else. We're not even telling a story here, just reciting events like a police report. Obviously, there's more to writing a good sentence than just a good idea stated clearly. It also has to be written well. This is the most difficult criteria by far, because unlike "clear," "written well" is highly subjective. To show you what I mean, let's take a look at one of my favorite segments from my favorite novel ever, Peter S. Beagle's The Last Unicorn. "I like to watch them. They fill me with joy. The first I felt it, I thought I was going to die. I said to the Red Bull I must have them, all of them, all there are. For nothing makes me happy but their shining and their grace. So the Red Bull caught them. Each time I see the unicorns, my unicorns, it is like that morning in the woods, and I am truly young, in spite of myself." I love this quote. Even now, decades after I first heard it in the movie, it makes me teary-eyed. If I could ever write something half this moving, I'd count it the high point of my career. But as much as I love these words, I'm sure there are writers out there who will roll their eyes and call it melodramatic. Which one of us is right? There's no real way to say. That's one of the great things about writing: we're all allowed to like different things. There are books and readers out there for all styles. But encouraging as that is, it makes setting down a hard rule for what makes a sentence good very difficult, because good is relative. Thankfully, while there's no way to write prose that will appeal to every reader, there's no one saying you have to. All that matters is writing sentences that appeal to your audience, which brings us to our final strategy for good sentence writing: use your good taste. If you're setting out to write a novel, you're already wearing your taste on your sleeve. Everything you write--your plot, your characters, even the words you use--reflect your taste as a writer. When you write a sentence, the same thing applies. Clarity is vitally important, but if you find a sentence boring, chances are your reader will, too. This is where you want to use your imagination and good taste to craft a sentence that is both clear and enjoyable. If you're not sure how to do this, just focus on what's interesting to you. What do you like? That's your taste. If you take a sentence, and you make it interesting to you while also being clear, that's writing in your voice. Is it a good sentence? Well, that's going to depend on if the reader's taste matches yours. But if you've followed the first two strategies and written a sentence that (1) has a well thought out idea that's (2) clearly stated, you will have a sentence that is objectively not bad. Beyond that, it really is a matter of taste, which is famously unaccountable. So don't worry about making everyone love your sentences. The most important thing, as always, is that you pay attention to your reader's experience. Don't write a sentence to hear yourself talk, write a sentence that clearly tells your reader what's going on in the most entertaining and/or dramatic fashion possible. Write the sentence you would want to read, and I promise you that, while it might not be the most beautiful words ever set to pixel, it'll almost certainly be enough to make your reader eagerly turn the page. And really, what else could you ask? 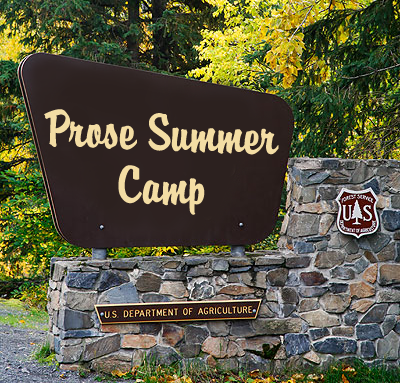 And thus ends another edition of Prose Summer Camp! If you enjoyed the essay, please follow me on Twitter/Facebook/Tumblr/Google+ to never miss a post. Thank you as always for reading, and I hope you're getting lots of writing done this summer! I'm going on vacation next week, but I've got something really awesome lined up for you guys, so keep your eyeballs peeled. Thank you again, until next time, and happy writing summer! I had an interesting few minutes just now, thinking about why Adams's line works so well for me, and why the kid's bowling-ball line doesn't. Maybe because the alien ships in Hitchhikers resemble bricks, except for how they, well, hang in the air. And they are utterly unfamiliar to the humans on earth, big blocky things that don't even look like the cool sci fi ships we dream up, and the way they hang there ignoring gravity is the most alien thing about them. Adams says all of that in one brief, hilarious sentence. One of my favorite lines of description is from Terry Pratchett's Diggers: It was raining so hard that it was like an upright ocean with slots in it. I think of that whenever it downpours. Good, basic sentence help, here! I cram my sentences full of thoughts, too. My editor just slashed up half my recent book for doing that. I'm laboriously working through it, fixing each instance. Writing is hard. Have to disagree with you on the 'bad' examples. I think they are all great. They're meant to be wry, don't you see? It's humour. Just to expand on my earlier assertion - take the line, "He was as tall as a six-foot-three-inch tree." Here's what the writer is doing here: they are deconstructing a cliche. The cliche is 'He was as tall as a tree.' Now, we know that most trees are much taller than the tallest people, so it's a poor simile as well as a cliche. The writer of this line knows this, so pokes fun at the cliche by specifying the height of the tree: 6 foot 3. He COULD just have written, 'He was 6 foot 3', but by adding the modified version of the cliche, he creates an amusing effect with what would otherwise have been a dull bit of description... while also conveying the idea that the character SEEMED as tall as a tree. The other lines are similarly clever, in their own ways. My favourite is: "His thoughts tumbled in his head, making and breaking alliances like underpants in a dryer without Cling Free." This is FANTASTIC writing. Why? Because it's a self-demonstrating simile. A person with random, tumbling thoughts might find that he thinks of something completely off-the-wall, like underpants in a tumble-dryer... and lo and behold, the line describing his thoughts ends up using just such an unlikely analogy. It is the very unlikeliness of the analogy that makes it so apt. In addition, it's just so very vivid: you can almost see that underwear sticking together with static. Do not be too quick to say that writing is bad just because someone else has told you it is. That person may have been wrong. Hey great post! In fact, great blog! Been around for a while but never really comment - just wanted to add in to what Nick said - I think the examples are bad sentences in the way Rachel has explained. But obviously if the purpose of the sentence was to evoke humor in the reader by being in-your-face bad then that's fine. However, if those sentences were merely trying to paint a picture and the writer thought that those sentences were the most clear/effective way to do so without putting odd images into the readers head which ultimately slows them down in their reading and smooth progression in the story - then yeah they've made a mistake. A favourite of mine: "John and Mary had never met. They were like two hummingbirds who had also never met." It's so bad it's great! Hi Roger. Again, I don't think you could do the hummingbirds one by accident. To me that has the hallmark of deliberateness about it. I don't think it's an outstanding example of humour, but to me it's very clearly a case of trying for a funny effect. There may well be a term for this kind of technique; perhaps you could call it a decoy or dummy simile (or it may be similar to the trope 'Metaforgotten' on the TV Tropes website). It's the text poking fun at itself by offering a simile that supplies no new information at all. i love to read your post. There may well be a term for this kind of technique; perhaps you could call it a decoy or dummy simile (or it may be similar to the trope 'Metaforgotten' on the TV Tropes website). It's the text poking fun at itself by offering a simile that supplies no new information at all.